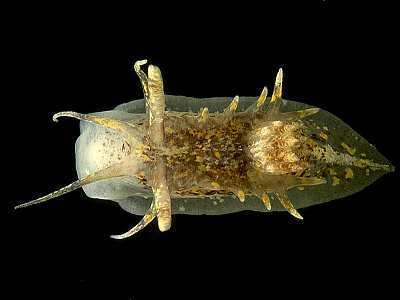 Description: The body of this nudibranch is cream in colour and is covered with yellow/orange and brown speckling. There are two pairs of long, thin, anteriorly directed processes that precede the rhinophores. There are two rows of finger like processes between the rhinophores and the gills, and up to four pairs of shorter processes surrounding the gills. The long rhinophores are lamellate. Okenia aspersa may reach a length of 22mm. Okenia pulchella appears to be a variety of this species. 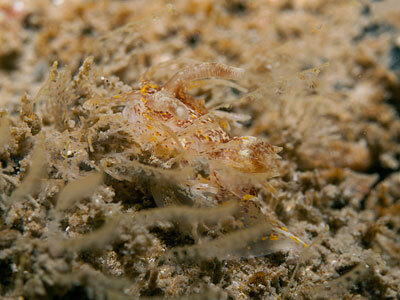 Habitat: This animal feeds on the ascidian Molgula occulta and possibly also on other ascidians such as Ascidiella spp. 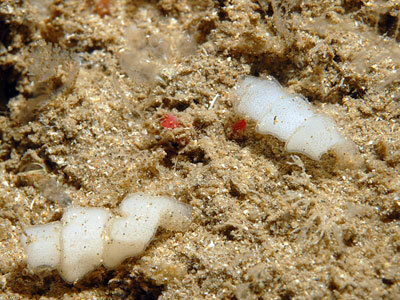 Molgula occulta lives buried below the surface of muddy sand and the nudibranch may burrow completely inside the ascidian. The spawn consists of a coil like a spring, attached at one end to the substratum. Distribution: Records for this species are few but specimens have been collected recently in the Oban area of W. Scotland and around Skomer Is. and as far north as Norway and as far south as Arcachon on the Atlantic coast of France. Long processes arising from the mantle edge. Mottled brown and yellow pigment on body and processes. Picton, B.E. & Morrow, C.C. (2016). Okenia aspersa (Alder & Hancock, 1845). [In] Encyclopedia of Marine Life of Britain and Ireland.